Thank you. This has been my favorite post, AB. I thought, as I read this post, of my own experiences in motherhood. The bittersweet understanding that each child must experience not only opposition in all things, but come to a full and complete comprehension of eternal cause and effect somewhere in the journey of their soul. I picture Mary, the mother of Jesus in the movie Passion of The Christ, running to her little boy after he fell and skinned his knee. She, as any good mother, would do anything to prevent pain in her child. She could not have been with Him in Gethsemane, for in witnessing the magnitude of his suffering she would have stopped the Atonement to protect her son, and would have become Satan in so doing. Likewise, Christ’s Eternal Companion was not present in Gethsemane to “comfort” Him, neither were “The Mothers”, as some have erroneously said, which is a key to understanding their deception. Women, by virtue of our incredibly enhanced emotional and spiritual sensitivity cannot offer or complete an Atonement, the burden of that pain would annihilate a woman. We may have the gifts associated with recognizing the worth of every soul and loving each unconditionally, we women may lead in compasionate, nurturing service, but ultimately it is the man, The Prototype of True Manhood, as Christ, who can lift a fallen creation and save a fallen soul. I love Him beyond words, and honor Him, and pray to the Father, who Christ was patterning Himself after in having accomplished an Atonement. The woman, the mother, sacrifices to bring forth the souls of men to mortal tabernacles, but it is the man, the father, who saves them from the effects of mortality and eternal entropy. In reading your post AB, my mind wandered back to Gethsemane as Denver described it in the 12th chapter of the book Come Let Us Adore Him. And I thanked my Lord and my Savior and my great Friend again for what He did for us, for me. 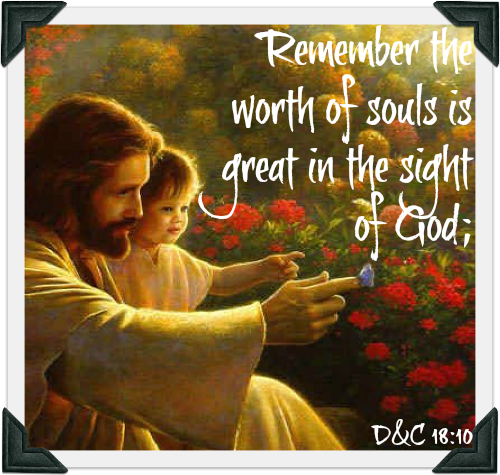 Only one who has paid that indescribable price in an Atonement can truly comprehend the real worth of a soul. We are all safe in His love for us. As ever you’ve shared valuable perspective. I want to share a bit of perspective that many may find to be at difference. We’ve been taught that fear is the opposite of faith. I don’t agree entirely. I believe fear is am “inexperience” in exercising faith. When in the New Testament a young father brought his palsied son to Christ for healing, Christ questioned the strength of the father’s faith, and in total humility, the father begged Christ to “help” his unbelief. As a parent and grandparent of disabled children, I don’t think the father lacked faith in the capacity of Christ. I believe he lacked faith in his personal worthiness in asking for the miracle, or perhaps knew the lessons parenting his son brought to his life, and he may not have felt confident he’d learned all that was possible, or he may have felt inadequate due to personal unrighteousness. He lacked the experience with exercising faith to know by the spirit that Christ’s healing would be granted out of love and mercy. If I’m in error in my perspective I’ll appreciate greater insight. My belief is stated here because I know the season is upon us wherein our faith may seem weak, unexercised or lacking when we may need it the most. I’ve always had faith can do ANYTHING, but in humility I haven’t always felt his will because the desires of my asking heart were so provocative. And as I’ve asked, begged, pleaded, questioned, negotiated, I’ve eventually seen the Lord’s purpose more clearly and found unanswered pleas and prayers were far greater gifts. Faith grows perhaps as we learn “thy will be done” may mean our faith isn’t lacking at all, but our experience in holding to our relationship with Father is actually another evidence we are faith filled. True faith is knowing God well enough ( his nature) to trust him, wait upon him… And continue to love and serve him despite feeling unworthy and inadequate, tested and disappointed. IT can be hard to keep in mind that every person we pass every day is a child of God and has the same divine purpose and potential that we all have and that all are worthy of being treated like children of God. Let me ask you this – in one of your subsequent posts you’re critical of the church’s immigration policies and express reservations about the current refugee crisis. I honestly don’t know what to think about the issue because it’s such a complex topic. Our government has meddled in the middle east and has provided weapons to just about everyone over there and has made things worse by encouraging the whole thing to begin with. The meddling and other feuds thousands of years old has created the circumstance of these refugees seeking safe haven. I have reservations about letting them in unilaterally due to the fact that in no time in history has a terrorist group been so hell bent on killing as many civilians as they possibly can and if they let in a million like Germany has, you would start to see much more frequent killings here in the USA. That and I believe that the cultures they come from do not reflect our values on treatment of women or on freedom of expression (consider how they would react if there were a Broadway show called “The Book of the Koran” – it would be met with condemnation from the left and with violence from the Islamists). Conversely, I find it shocking the overall lack of compassion that many traditional conservatives show to the legitimate needs these people have – basic needs just like living without imminent threat of death. What would you do or recommend doing knowing those people are the same children of God that we are? Sorry to hijack these comments but I didn’t see any way to contact you, Anonymous Bishop. But at least it is extremely relevant to the topic of this post. There is an effort underway to have a group 40-day fast (whatever a fast means is up to each individual) to be done from February 8 to March 20. The purpose of the fast is to be blessed with charity. I certainly need charity and I’m guessing that many others do as well. I see this fast as a chance for us Gentiles to actually rise up and do what the Lord needs us to do. Please consider sharing this fast with your readers. The invitation, along with several important points and scripture references, can be found here: fastforcharity.blogspot.com. Thanks. This is awesome, but someone might want to share this with the church leaders.